Of course, these beneﬁts are most pronounced in the context of an overall healthy diet. No one food – even whole grains – will guarantee good health. It’s also important to remember that some whole grain foods are healthier than others. Plain grains — from brown rice and quinoa to wheat berries –– and whole grain pasta should be a regular feature on your table, with processed grains eaten less often. Sure a whole grain cookie is better for you than a reﬁned grain one, all other ingredients being equal — but it’s still a cookie! Check out the Oldways website for overall diet information and inspiration about the health beneﬁts of traditional diets, including the Mediterranean Diet. 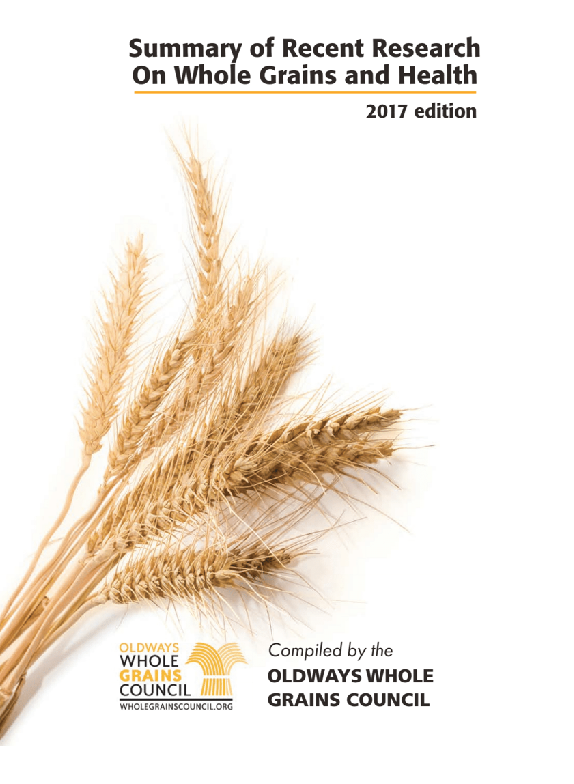 In 2009, the Oldways Whole Grains Council released a research summary of major studies analyzing the health beneﬁts of whole grains and published from 2004 to 2008 (archived below). In the years since, more than 100 new studies on this topic have deepened our understanding of why whole grains support good health. In this new report, we’ve summarized 112 studies published between 2012 and 2017, to make this knowledge available to health professionals, policy makers, and anyone else who can beneﬁt from this compilation. In April 2010, the American Society for Nutrition brought together researchers to review the evidence regarding the health beneﬁts associated with whole grains. Current scientiﬁc evidence indicates that whole grains play an important role in lowering the risk of chronic diseases, such as coronary heart disease, diabetes, and cancer, and also contribute to body weight management and gastrointestinal health. The ﬁndings were published as a supplement to The Journal of Nutrition in May 2011 and made available as a Free Article.